Vinyl and wheels are words that may not often be found in the same sentence but that doesn't mean they shouldn't be. Due to advancements in vinyl film production and adhesive technologies, today's wrap and electrocut vinyl films can be used in the most extreme and demanding applications and give you years of durability and performance. In this quick guide, we'll cover the top 5 vinyl modifications for your vehicle's wheels, tires, rims and brake calipers that you can install yourself and that won't break the bank while you're at it. Installation, though not easy, is a straightforward affair. Cleaning and preparation are your best friends which is why we've come up with a guide on cleaning your calipers for wrapping. Once you've cleaned them, follow our regular wrap instructions to get the best results but be forewarned: patience is required. Prices vary but begin at $25 per kit. There are a number of sites out there who offer short term vinyl tire stickers with licensed logos and brand names or custom lettering. In general, it seems like you can choose from a wide variety of colors but it seems that the most popular color of tire decal is white due to the high contrast it has with black tire walls. These sticker kits are perfect for car shows, races and photo shoots and are intended to last for a two week period. Vinyl tire letter decals kits are a quick, customizable, and inexpensive improvement over tire paint or tire pen products that discolor over time. You can expect to pay around $40 per kit. Available in a number of licensed and knock-off versions, our favorites are made from reflective vinyl. Popular especially with the MOPAR crown and Honda owners we've also seen a number of tuner meme decals and sticker bomb center cap wraps too. Inexpensive and easy to apply, even your kids to install this mod. Start at $10 and go up from there. Whether you choose popular and high-visibility reflective rim stripes, go for a solid color or add the exotic look of carbon fiber or camo, rim stripe decals are an affordable alternative to hard, plastic rings that apply with tape or clips. Not only are they cheaper but they are better looking, easy to use and can be installed in a matter of minutes. All you really need to do is measure the size of your rims and make sure you buy the correctly sized kit. You can find rim stripe decal kits for as little as $9.99. 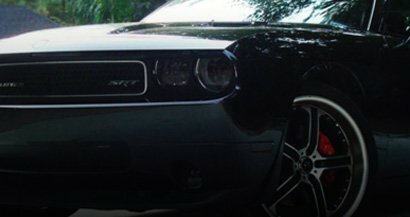 We don't know who started it but Camaro and Challenger aficionados alike seem to have a love affair with hash mark wheel rim decals. We've yet to see them on a JDM rocket bunny but, really, it's only a matter of time. Easy to apply, you just need to insure you have a 3-inch opening in your rims to apply these kits. Get yours starting at $15 shipped. We know we only said we were going to cover 5 vinyl wheel mods but we kind of feel like we'd be doing you a disservice if we didn't mention rim wraps. Whether you're tired of the look of your factory rims, want to hide scuffs and oxidation or want a stylish way to add a little protection from curb rash, rim wraps are the way of the future. Choose from a dazzling variety of styles and brands to get just the look you want like 3M™ 1080 Color Flip films for iridescent rims, Avery™ Carbon Fiber for a custom look or Rwraps™ Sticker Bomb to show off your JDM style. 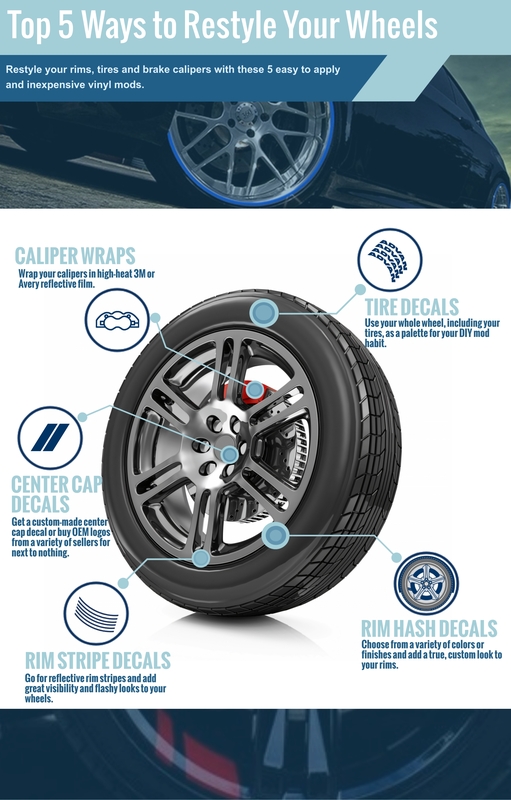 Check out our install guide to applying rim wraps and maybe you can add all 6 mods we've covered today!